Hi all! This Easter I’m sporting this fun paisley design :-D. The paisley pattern is a classic design and can be found as an accent or at the forefront of fashion pieces year-round. 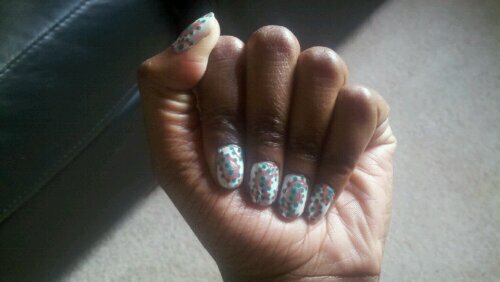 I decided to use bright colors for this mani since it’s actually feeling like spring outside. 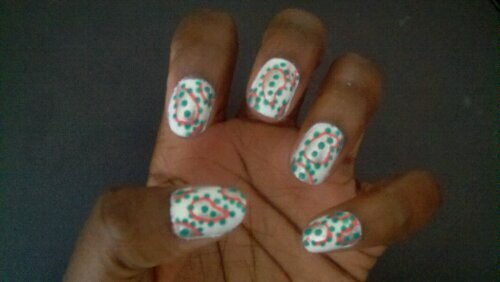 I used China Glaze White On White for the base color and Orly Pixy Stix (coral pink), Dazzle (chrome silver), and Green With Envy (well…green) for the detailing. 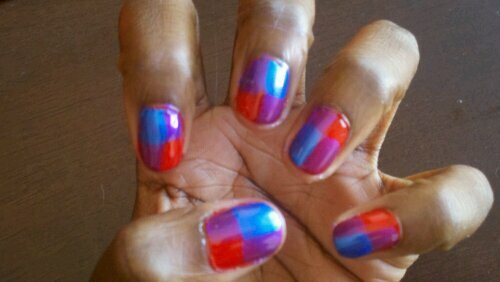 Now that I’ve finished this look, I’m ready to get out in the sun and enjoy the weather. Happy Easter everyone…I hope you enjoy your weekend!! As promised earlier this week, I brought you another classic spring/summer fabric pattern–seersucker. 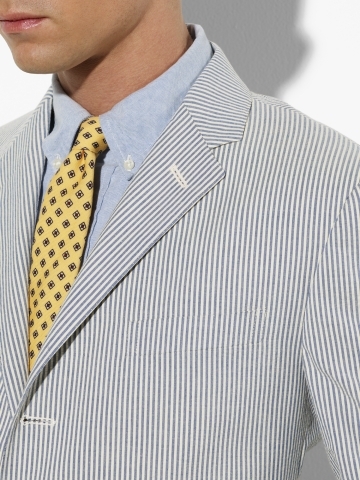 The seersucker fabric has been a mainstay in men’s fashion, especially in the South, for decades. Commonly used for men’s suits and sportcoats, this fabric has crossed over into women’s and children’s fashion. Its lightweight cotton material makes it a popular choice in the summer as you can be fashionable while staying cool in the sun. The seersucker stripe can be found in green/white, pink/white, and a host of other combinations (I actually own a pink/white seersucker suit…see below). But, the original blue/white stripe is probably the most recognizable–and oldest– variation. 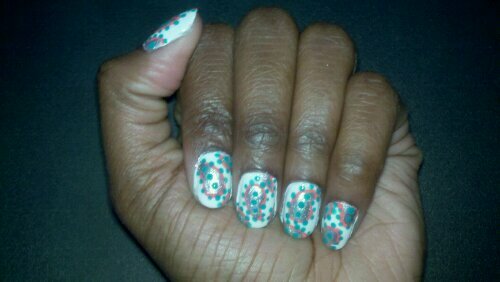 For this I used China Glaze Sea Spray (Anchor’s Away collection) and my trusty white Art Deco nail striper. To show that seersucker is still very much in demand, here’s an example: a men’s sportcoat from the Polo Ralph Lauren Collection priced at a meager $1150. :-O! 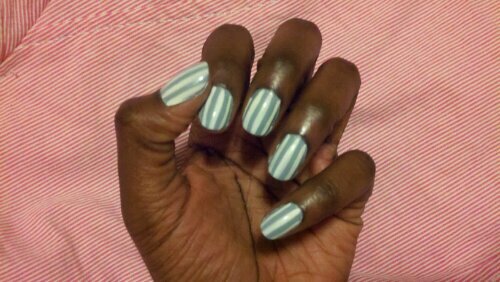 Easter is less than a week away and other than baby chicks and pastel-colored eggs, the gingham print really puts me in the Easter-Springtimey mood. It seems this pattern never really goes out of style whether it’s on little girls’ Easter dresses, mens’ shirts, picnic table covers or country living interior design magazines. 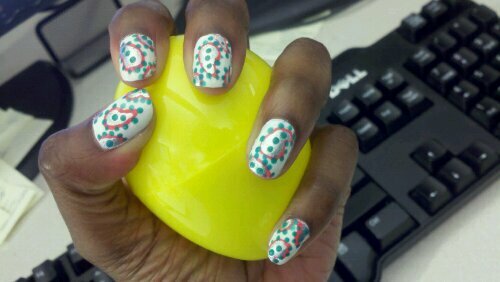 To make it extra cheery, I chose 3 pink colors to create my design: China Glaze’s Oxygen for the base, Art Deco’s Baby Pink nail art striper for the lines, and OPI’s Hot-Hot-Hot for the dots at each line crossing. P.S. Isn’t gingham a funny word to pronounce?